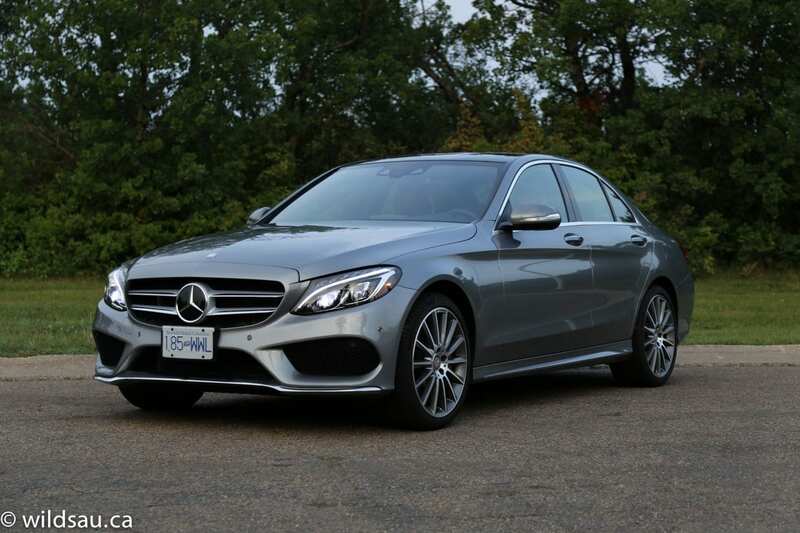 Is the C400 the perfect C-Class model? Well, it certainly was! 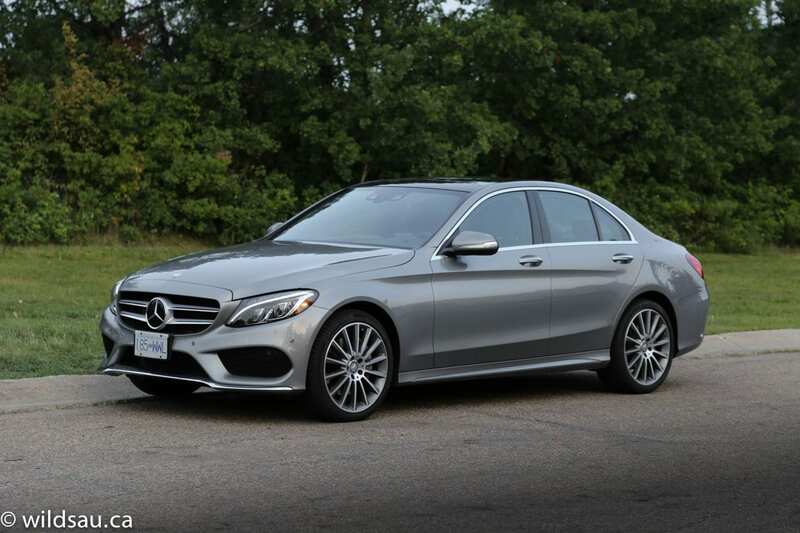 The new C-class is pretty revolutionary and feeds off Mercedes’ new corporate styling language. As a matter of fact, I occasionally have a difficult time distinguishing the C-class from a new S-class. That’s a good thing – at least for C-class owners! In my opinion, it’s a great-looking car with dramatic proportions – especially that wicked short front overhang. 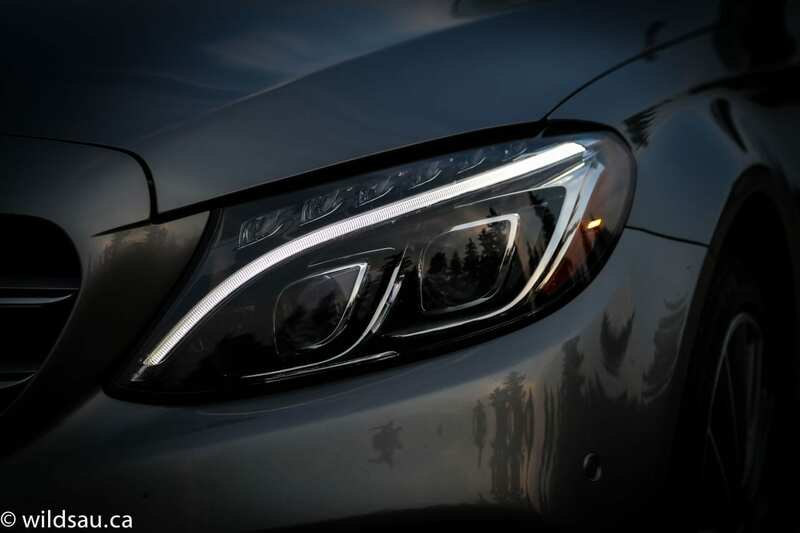 You’ll find LEDs all around – starting with angry-looking LED driving light eyebrows. 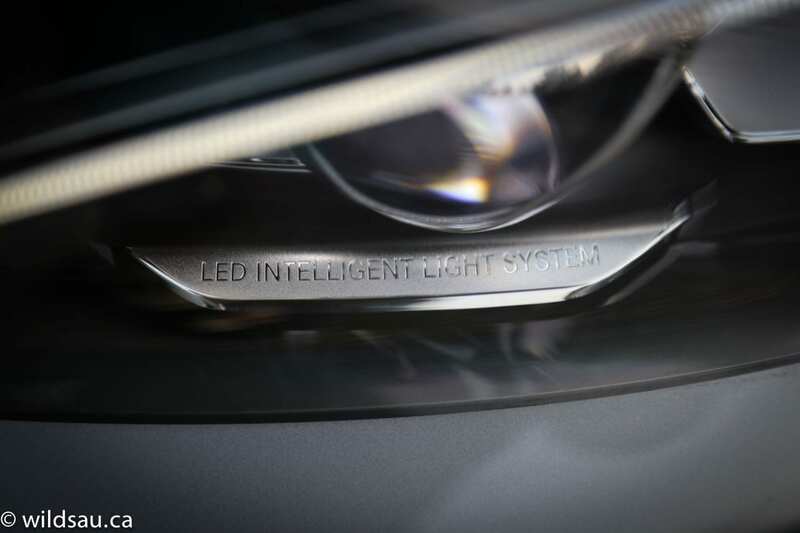 The headlights and tail lights are also LEDs. The whole front end looks pretty aggressive with those massive air intakes (with their diamond-mesh inserts) appearing to be gulping air, and a slick “wing” front spoiler. 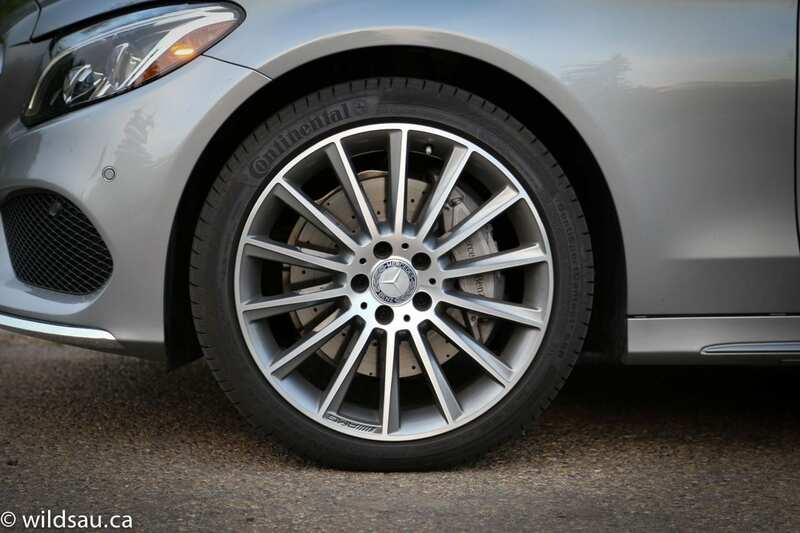 The 18-inch AMG wheels look fantastic, especially once you spy the big rotors and MB-branded calipers within. This car gets a whole lotta looks, and for good reason. Inside you’ll find a fresh, modern take on interior styling. The sensuous but subtle shapes are delightful – I particularly like the vertical waterfall edge and clean lines on the dash. 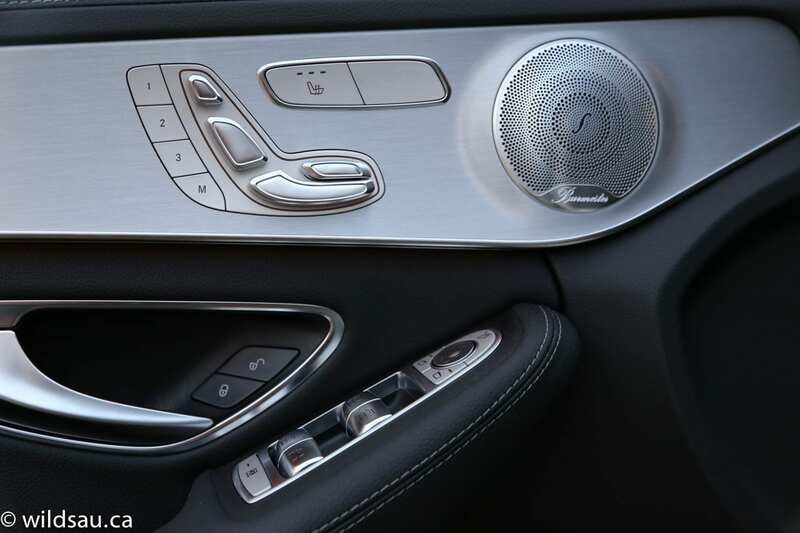 Mercedes’ use of high-grade materials is nice – soft-touch surfaces can be found everywhere throughout the cabin, and visually they are brought to life with nice brushed aluminum accents as well as the contrasting stitching on the dash and seats. 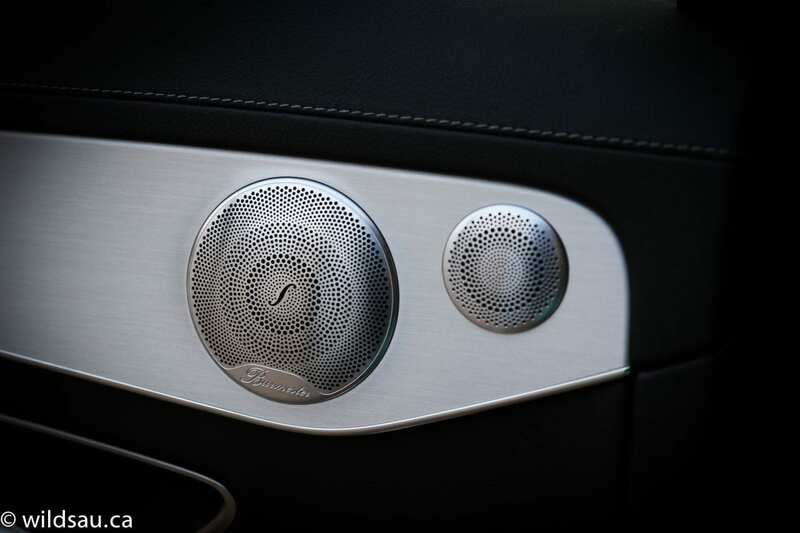 I can’t forget to give the beautifully machined Burmester speaker grilles a shout-out too – they’re the nicest in the industry. 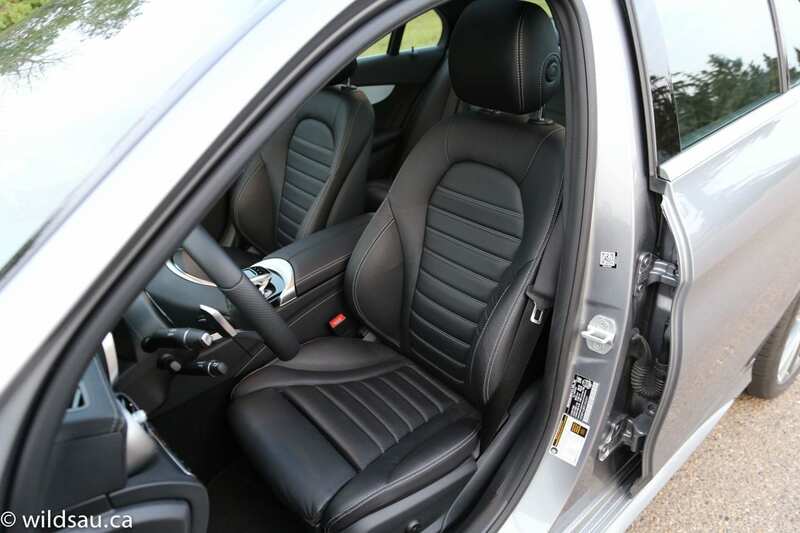 The heated seats are insanely adjustable, including power servos for the headrests and knee bolsters – thankfully they’re also very comfortable and offer outstanding bolstering and support – a very good combination. The centre stack gets a slick new look too, and is nice and clean. Unfortunately the piano black trim shows dust and fingerprints instantly and it’s quite a chore to keep it looking clean. Speaking of nicest-in-the-industry, that continues for the C400’s screen. It is simply unsurpassed, and is, in my opinion, the sharpest one out there, with the best contrast you’ll find. The input device(s) aren’t the best though. You use a combination of a rotary COMAND joystick (which is familiar from previous generations of the system) and a wrist rest that doubles as a touchpad and a fingertip input device that allows you to write letters and numbers which the system recognizes. It works, but I found it distracting enough that I’d never really consider going that way if this was my car. Of course there’s a dual-zone climate control and you will more than likely love the two sunroofs – one huge panoramic one over the front passengers (it opens) and another smaller one above the rear seats. 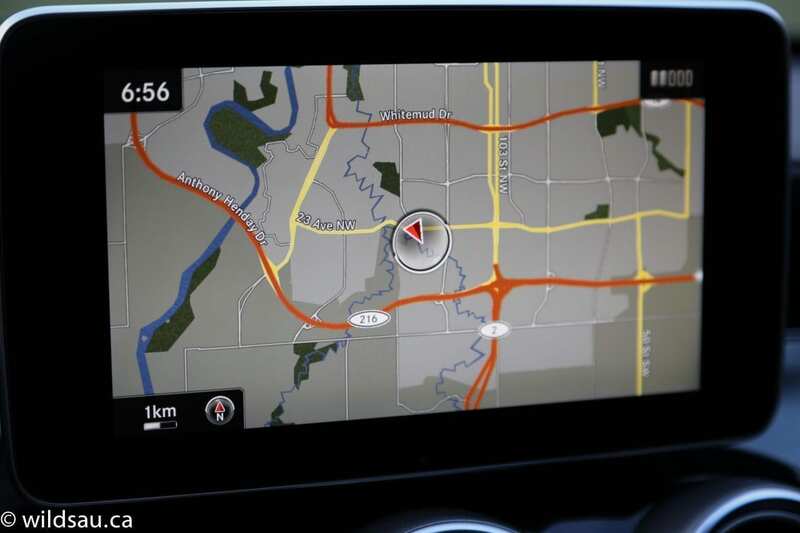 Are you a driver assistance technology junkie? 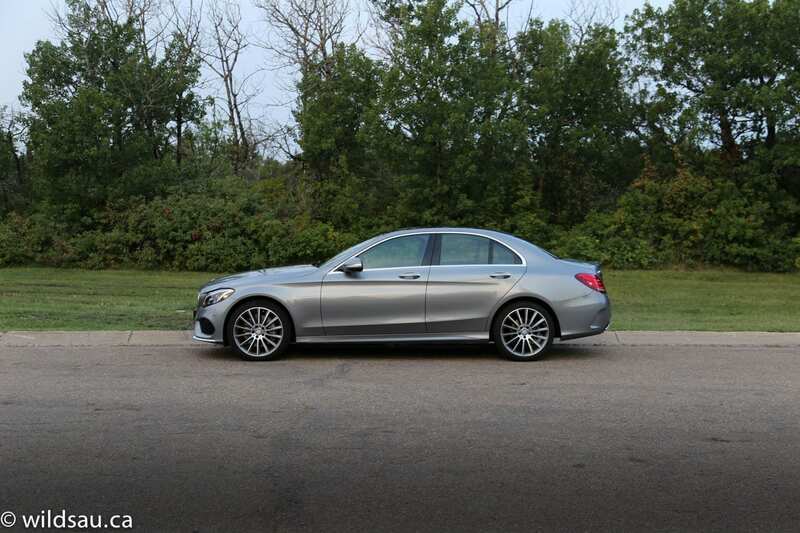 The C400 doesn’t disappoint – optioned as it was, my review car came equipped with a backup camera with front and rear parking sensors, DISTRONIC adaptive cruise control with steering assist, active parking assist, blind spot assist, active lane keeping assist, attention assist (that tells you when you need to pull over for a break! ), cross-traffic alert and autonomous emergency braking. Phew! 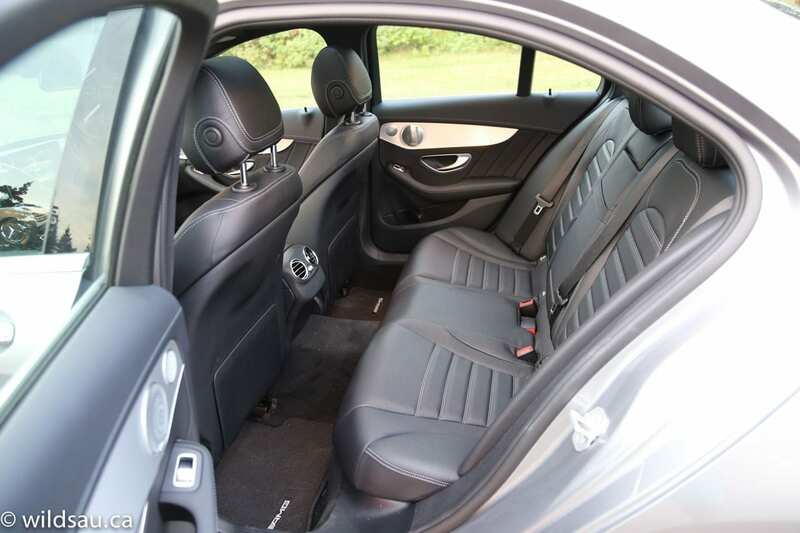 It’s just the front seats that rock – the C-class’ rear seats are very comfortable too. Leg room is very generous, however I found the head room to be quite limited – there was enough room for me (at 5’10”) but my hair was about a millimetre away from the headliner. The two outboard passengers are the lucky ones, because they don’t have to straddle the large floor tunnel. You get an ashtray in the back, as well as a 12V charging plug and adjustable air vents. Our three kids didn’t fit very well, due to the restricted middle seating position – the unlucky piggy in the middle would always be complaining. There are 2 sets of ISOFIX child seat anchors if you have little ones. You’ll find two cupholders and an(other) genuine good old-fashioned ashtray under the large hinged lid in the console. The clamshell lid for the armrest opens to reveal a small storage bin – 2 USB plugs are in there as well. 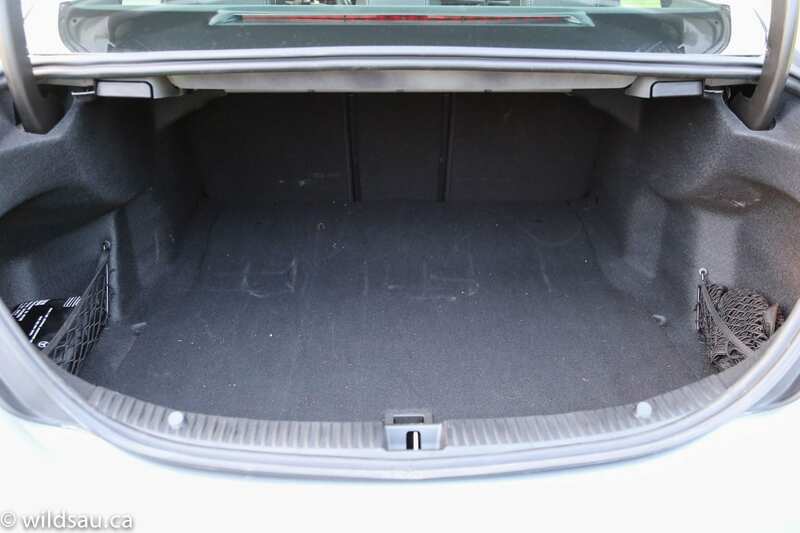 The swoopy styling makes for a not-so-great trunk – its shallow height makes it troublesome when it comes to transporting anything taller – full-size suitcases presented a major challenge. 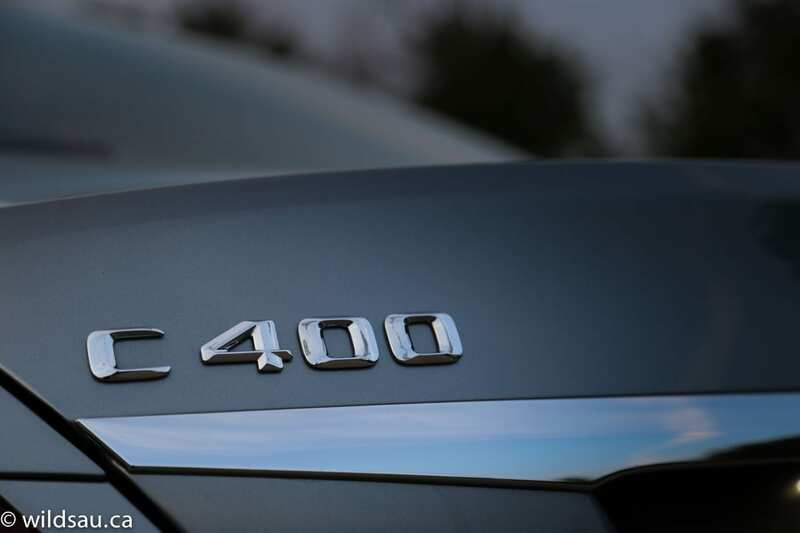 The C400 gets a 3.0-litre twin-turbo V6 that churns out 329 HP and 354 lb.ft of torque. 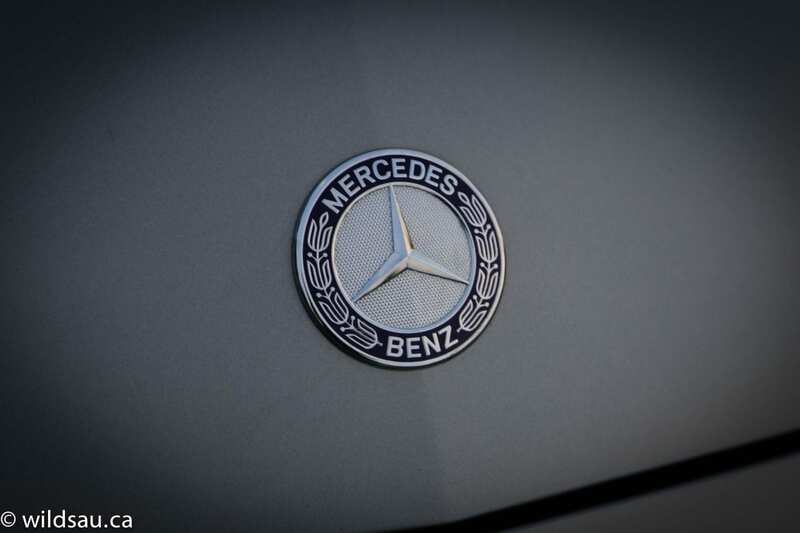 It shares a 7-speed automatic with its other C-class stablemates and gets 4Matic all-wheel drive. 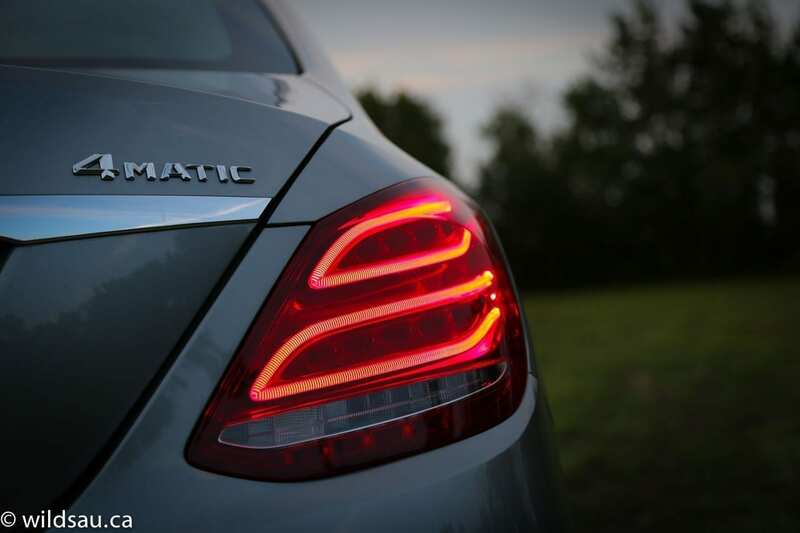 Mercedes-Benz rates it at 11.1 L/100 km (21 US mpg) in the city and 8.4 L/100 km (28 US mpg) on the highway. We ended up averaging 11 L/100 km driving the C400 with a fairly heavy foot. 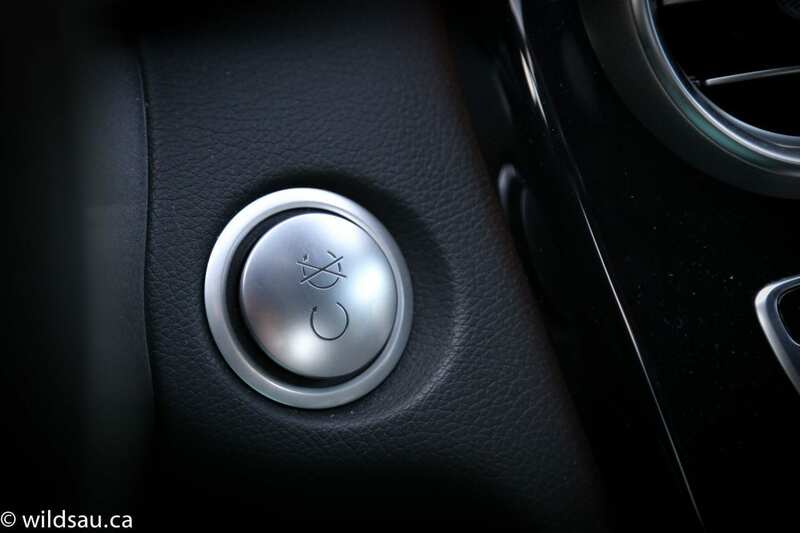 You aren’t rewarded with much drama when you depress the C400’s push-start ignition. 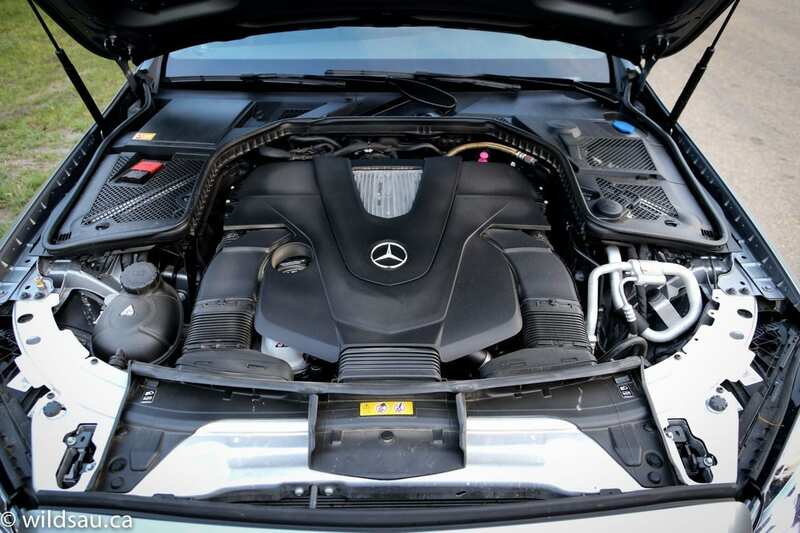 It purrs resolutely, and you wonder if there’s much going on under the hood. But the low, sporty seating position encourages you to play a bit, and the V6 surprises with turbine-smooth power delivery. The car never feels as if it is stressed out of straining. 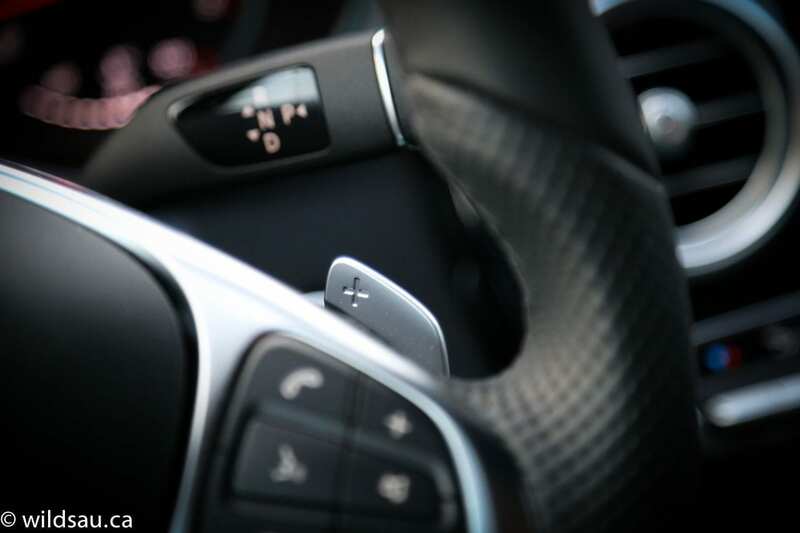 There are four driving modes – Eco, Comfort, Sport or Sport +. I found the latter two to be very transformative in the C400, as they dial up the responsiveness and firm up the suspension. The car has tons of power and is surprisingly quick in the Sport and Sport + modes. Though there’s no drama at idle, the engine, under heavy throttle, makes nice throaty V6 sounds. 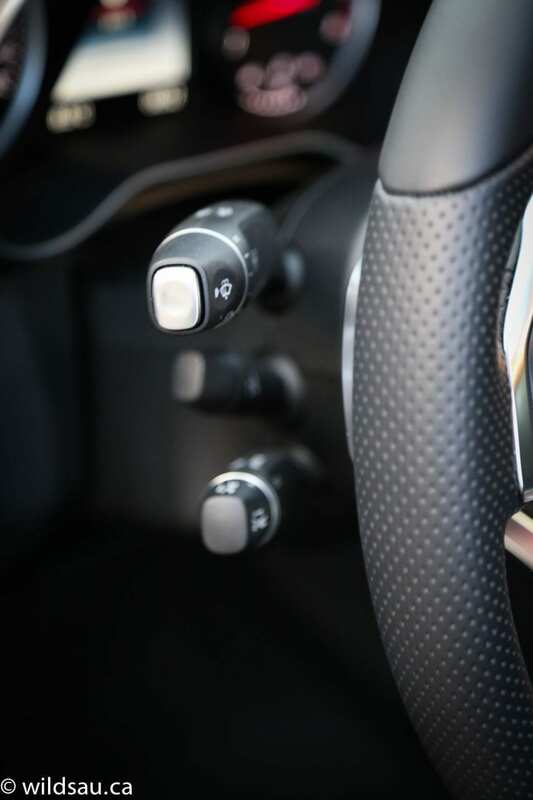 The transmission is mostly a smooth affair, doing its job without complaining or hiccups, and it doesn’t fear holding onto a gear right through redline depending on which driving mode you’re in and how you’re driving. 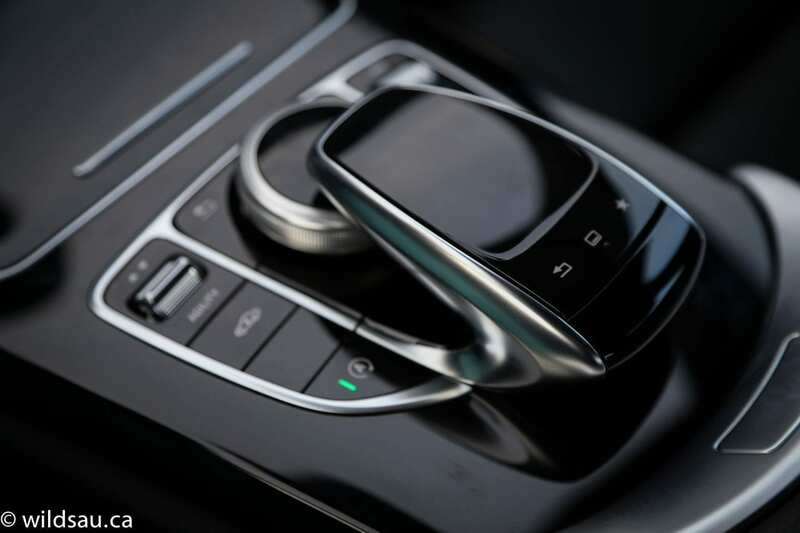 You can also use the paddle shifters to keep things somewhat manual. The sporty suspension hits a nice balance between excellent handling (with a bit of body lean) and a generally compliant ride, other than over some bigger hits like potholes, which definitely crash through into the car. The C400’s sport brakes are quite powerful but never felt grabby and they haul the car down with tremendous force when called on. 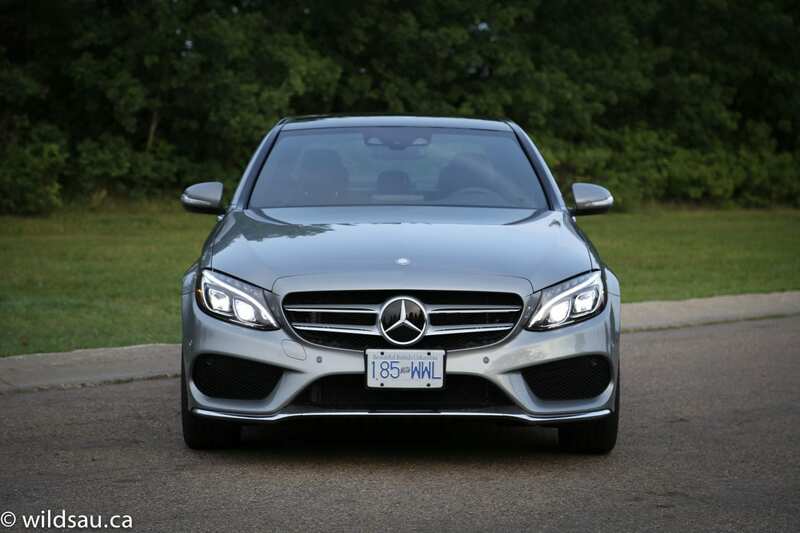 We found the C400 to be incredibly smooth and quiet – especially at 80-100 km/h. It was very impressive indeed. A little nitpick – the steering assist weirded me out. It works OK on the freeway and basically drives the car for you, which is a creepy and wholly unnatural feeling. Where it doesn’t work well is in a more congested area where it will hit the brakes hard and veer back into the lane if you drift a bit. That is even more unnerving than allowing your vehicle to steer for you on the freeway. I chose to turn off this technology after giving it a few tries. I found that there were too many stalks on the steering column, especially the three on the left side. 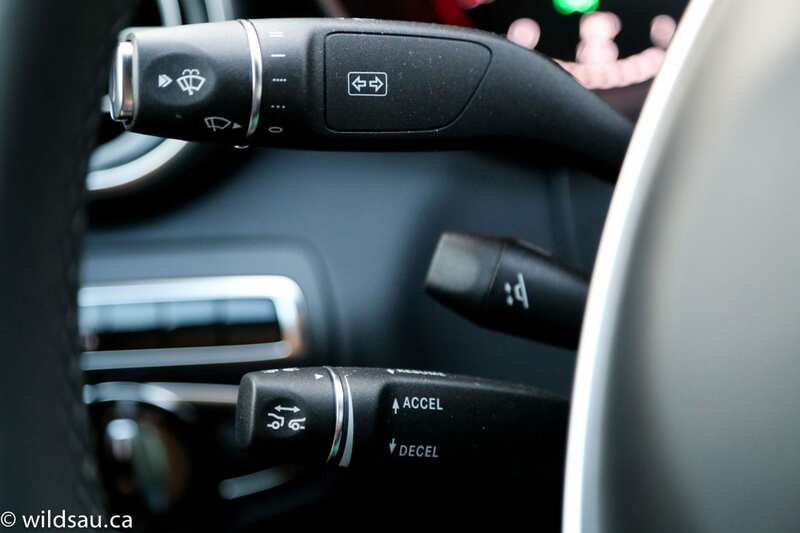 In addition, the cruise control stalk is completely hidden from view which means there is no way you can use it without either a) being familiar with it or b) pulling over to see what its functions are. I’m not a fan of putting the volume control on the centre console and wish manufacturers would leave it on the centre stack where I’m used to reaching for it. Fit and finish seemed outstanding with one exception – I heard some mild rattles from the rear window ledge when I’d hit some bigger bumps. 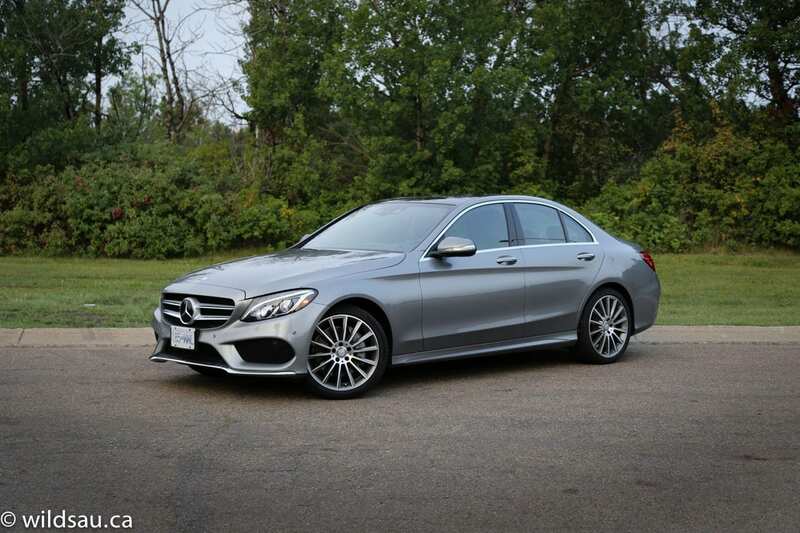 So, is the C400 the perfect C-Class? Well, if you’re wanting a serious performer, but don’t feel the need to dip your feet into the ridiculousness that is the C63 (and by that I mean ridiculously awesome, but also expensive and inefficient), it might be. Here’s the thing. 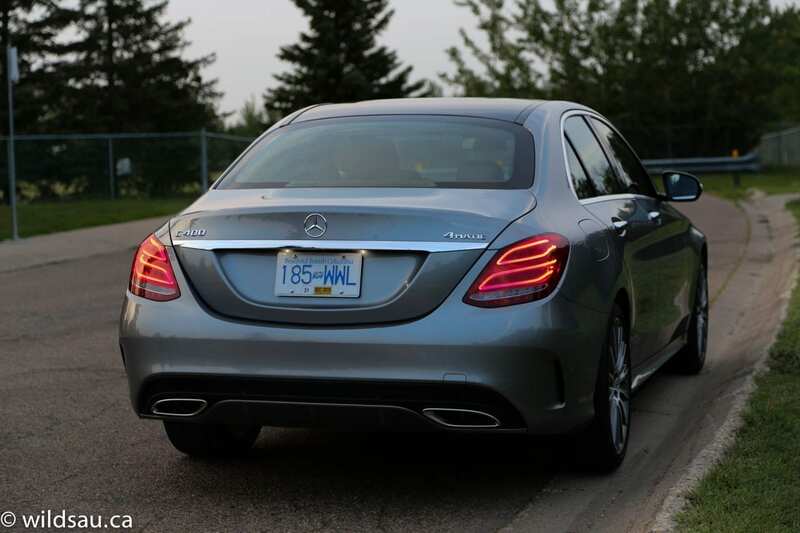 It’s almost a bit silly for me to have reviewed this, because now there’s the 2016 C450, which is the same car but it has taken the engine/performance (362 HP, 0-100 km/h in 4.9 seconds!) up another notch. 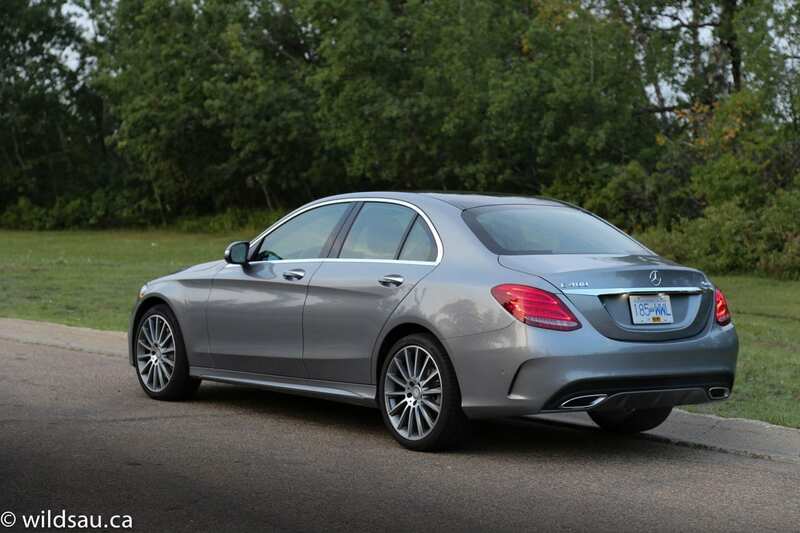 So yeah, you’d be fine with the C400 but if you head into showrooms right now, you’ll probably be able to choose between a stellar deal on this 2015 C400 or the new 2016 C450. Both would be an awesome choice. WAF (Wife Acceptance Factor) was very high. She loves Mercedes products as it is (there’s a slight bias since she drives one on a daily basis), but she really did like the C’s styling and said it was very easy to drive. She said it looks the part, and loved that people would be checking it out in parking lots. What more do you need?